This is an IMPORT version of one of the best selling key accessories of all time. 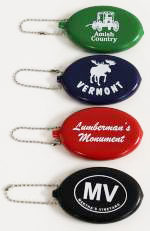 These are made from heavy-duty PVC plastic and are attached to a nickel plated bead chain. Colors are ASSORTED ONLY: Black, Blue, Red, and Green. Made in China.